This year, the New Years falls on March 20th, you see the time and exact date of the Persian New Year always varies, because it happens exactly at the time of the vernal equinox and marks the beginning of spring. While the traditional New Years day dish is sabzi polow with fish, what is consumed on the eve of the New Year is always a dish containing some sort of noodles. Why noodles? Well the Persian name for noodles is reshteh, reshteh also means path or way in Persian. So the purpose of eating a dish with noodles is to wish for a fresh new path in the New Year and hope that we would find ways to circumvent our problems in the coming year. In Iran you can easily find the special noodles for this rice, which is normally a very fine noodle. In US however I find that the noodles sold for reshteh polow in Persian and Middle Eastern stores are very thick which are not really suitable for this rice. So in our house we use vermicelli for noodles and it turns out as good as the ones in Iran. Place the rice in a large bowl and cover with water. Agitate gently with your hand and avoid breaking the rice grains. Then pour off the water. Repeat this 3 to 4 times until the rice is completely clean. This way we are trying to extract as much starch as possible in order to get fluffy rice. Soak the rice with 8 cups water and salt for 2 to 4 hours. Break the noodles into 1 inch lengths and brown briefly in a frying pan with 1 tablespoon oil, shaking and turning constantly, until they turn to a golden brown color and you start to smell a nutty aroma. Set them aside. To cook the rice, add water to a large pot and bring it to a boil. Add the drained rice to the pot. Boil for 6 to 8 minutes, gently stirring with a slotted spatula. The rice must grow and cook, but not overcook. This is the most crucial part of preparing chelow, draining the rice too early or too late will result in either uncooked or sticky rice. Bite a few grains to test the rice. Drain the rice in a large, fine-mesh colander. Make sure there is no grain of rice left in the pot. Put the pot on the stove top again and increase the heat until the bottom of the pot is dry. Add ¼ cup of vegetable oil, and let the oil get hot. Take 2 to 3 spatulas full of drained rice and gently place it in the pot, cover the rice with some of the browned noodles. Now add 2 spatulas on top of the noodles and then cover them with some noodles again. Repeat this process and shape the rice into a pyramid as you go, until you have all the rice and noodles in the pot. 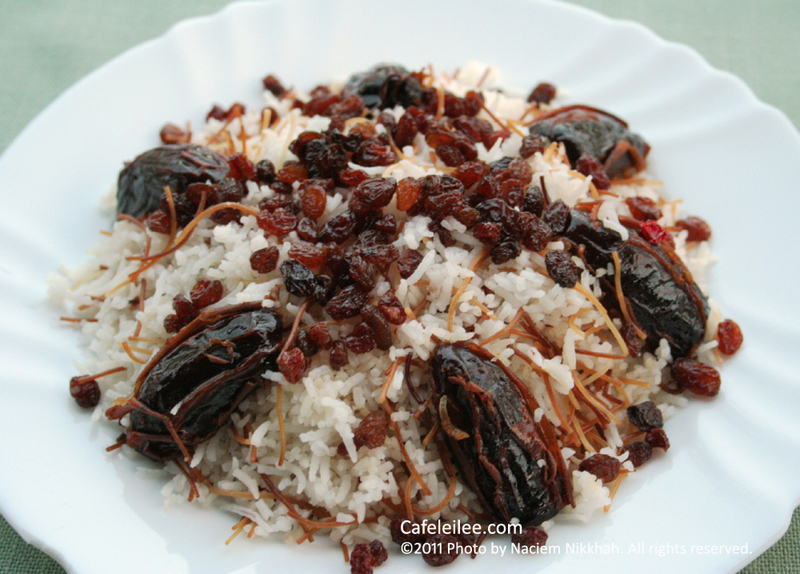 add the remaining oil or butter onto rice, and arrange the dates on the rice. Lower the heat to medium low to low, cover the pot with a clean towel or 3 to 4 layers of paper towel then cover it with the lead and let it steam and cook for 40 to 50 minutes. 5 minutes before serving in a frying pan, melt 1 tablespoon of butter or oil and add the raisins. Give them a quick stir then set them aside. When it's time to serve, remove the dates and set them aside. Using spatula place rice on a serving platter without touching the crust. Mound rice in shape of a pyramid. 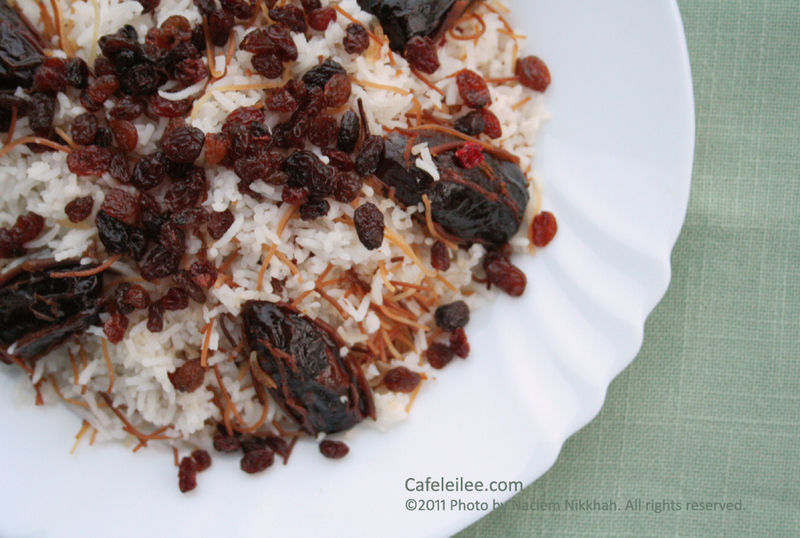 arrange the dates on the rice again and top it with the raisins. Break the crust and serve it as a side. This dish is normally served with saffron chicken. یادم میاد نوروز ۱۳۷۰ هنوز بچه بودم و رفته بودیم یک جا عید دیدنی. صاحب خونه داشت شکایت میکرد که دهه ۶۰ چقدر زود گذشت و داشت دهه های مختلف رو مرور میکرد. حالا من خودم تنها سالهای عمرم که یادم بود همون دهه ۶۰ بود و پیش خودم فکر میکردم که این خانوم چقدر باید سنش باشه که از این همه دهه خاطره داره. حال دو دهه از اون موقع گذشته. ده سال پیش این موقع من چند ماهی بود که برای همیشه به آمریکا کوچ کرده بودم، دور از خانواده بودم و از آینده بیخبر و الان باورم نمیشه که دهه ۸۰ هم به این زودی گذشت. به هر حال این هم دستور رشته پلو برای شب قبل از عید که امیدوارم کمک کنه امسال رشته کار تو دستمون باشه. اگر خارج از ایران هستین پیشنهاد میکنم که از ورمیشل به جای رشته پلویی استفاده کنید که نازک هست و بعد از تفت دادن مثل رشته پلویی میشه. رشته ها را به قد ۵/۲ سانتی متری خورد کنید و در یک قاشق کره و یک ماهی تابه تفت دهید تا رنگشان قهوه ای شود. یک قابلمه بزرگ را پراز آب کنید و بگذارید جوش بیاید، آب برنج را خالی کنید و برنج را به آب جوش اضافه کنید. بگذارید برنج برای ۵ تا ۸ دقیقه جوش بخورد تا برنج قد بکشد و مغز آن پخته شود. برنج را آبکش کنید، و قابلمه را دوباره روی اجاق بگزارید با حرارت زیاد آب آن تبخیر شود. سپس حدود ۴/۱ پیمانه روغن ته قابلمه بریزید، و هر وقت روغن کاملا داغ شد، دو سه کفگیر از برنج را توی قابلمه بریزید. بعد کمی از رشته را روی برنج بریزید. دوباره روی رشته را یکی دو کفگیر برنج بریزید و کمی رشته روی آن پخش کنید. این کار را ادامه دهید تا همه برنج و رشته مخلوط شوند. باقی روغن را روی برنج بدهید و خرما را اطراف برنج بچینید. شعله اجاق را کم کنید و در قابلمه را با حوله تمیز بپوشانید و قابلمه را با آن بپوشانید. بگذارید تا برنج برای حدود ۴۰ دقیقه دم بکشد. قبل از کشیدن برنج توی یک تابه یک قاشق کره آب کنید و کشمش را در آن تفت دهید. خرما ها را جدا کنید و برنج را توی دیس بکشید. خرما ها را دور آن بچینید و کشمش ها را روی برنج بریزید. این برنج را با مرغ زعفرانی سرو کنید. great Blog and recipes, I like Rice for main menu everyday, thanks for share your recipe.